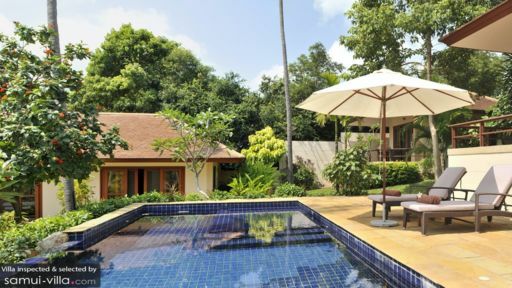 An ideal location, idyllic setting, and the epitome of relaxation, Manmuang Villa on Choeng Mon beach near Bo Phut, Samui, and the very popular Chaweng area, is a three-bedroom tropical haven for guests. Seamlessly integrating the natural elements of the island with the traditional interiors of Thailand, the villa provides a sanctuary where you can relax and regain your strength amidst a serene and tranquil ambiance, where all you have is the sun, sand, and water to put your mind at ease! 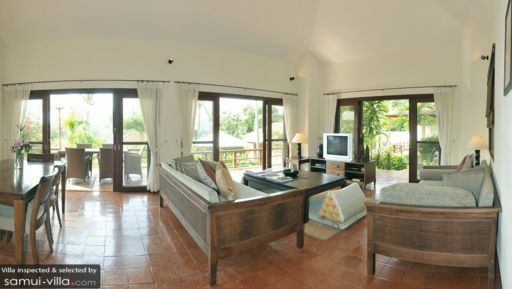 The villa has three bedrooms that have been furnished with comfortable double beds, to ensure you have the best sleep. The bedrooms are air-conditioned and provide excellent views of the swimming pool and garden. The master bedroom has a partially, open-air bathroom, and the other two bedrooms also have en-suite bathrooms. The bedrooms are all air-conditioned to provide a chillier and cooler alternative to lounging beside the swimming pool under the sun. Right outside, fringed by tropical foliage of all varieties, lies the 10-metre mosaic-tiled swimming pool where you can take a dip, soak your feet, splash around or simply lounge. The sun deck besides the pool holds several sun chairs, meant for sunbathing, reading, or sipping on chilled drinks. There is a terrace furnished with an alfresco dining area, so guests can enjoy eating against a stunning view. A relaxation pavilion where can spend some quality time with loved ones is also located around the pool, for a refreshing and rejuvenating time. The entire villa is surrounded with tropical gardens with exotic and sweet-smelling flowers, plants, and dense bushes. The welcoming living area is located directly connected to the swimming pool and deck, so you can around with ease. The air-conditioned living area features glass doors and walls so that the room can remain breezy and well-lit during the daytime. A high-soaring ceiling is reminiscent of a traditional Thai home. The room is furnished with cozy sofas as well as a television, so you can entertain yourselves while resting up. The dining area and kitchen is located right behind the sitting area, comprising a six-seater, wooden dining table and a fully-equipped kitchen. The kitchen is functional and ready for use. There is even a writing desk in the area, if you wish to work on something. The living area leads to the terrace as well, which has the alfresco dining area for a nice dine-under-the-stars experience. 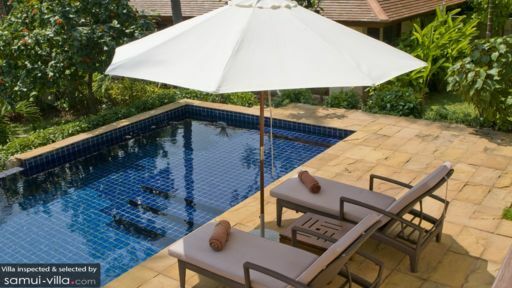 Manmuang Villa is fully-staffed with a manager, housekeeper, gardener, and pool maintenance. There is personal guest assistance and the chef will even prepare a delicious breakfast each morning, included in your stay. If you desire, other meals can also be prepared, at an additional cost. There is a tennis court for the sporty members, so they can play a match or two! There is a lot going around Choeng Mon, including the Choeng Mon Night Market, where you will find local souvenirs, Thai street food, and other such sights. Big Buddha Bophut is another must-see sight right beside the ocean. Chaweng with its crazy nightlife, restaurants, bars, and shops is also not far from the villa, and you can even head to Chaweng beach!